Everyone, prepare to have your minds blown because The Punch Escrow will be like nothing else you’ve ever seen. It does, however, have all the makings of a runaway hit which will no doubt strike a chord with a broad range of readers, reaching even those who might not normally read sci-fi. Just think about books like The Martian, Ready Player One, Dark Matter, or any other examples of hard science fiction that has achieved widespread popularity due to the fact they are not only clever and technological, but also a lot of fun. This is the successful formula Tal M. Klein has managed to capture and apply to his phenomenal debut. The story opens in the year 2147, in a world completely altered by technological advancements and their implementation. Still, there are some things that never change, like the fundamental human need to connect with others and conquer the physical distances between ourselves, leading to continuous research and development to find newer, better ways to make travel from point A to point B as fast and efficient as possible. A corporation called International Transport believes it has found the answer. While the technology that makes teleportation possible has already been around for decades, it was IT that finally turned it into the ideal mode of transportation for human beings, making it viable, affordable, and, above all else, safe. Or so they say, anyway. Enter Joel Byram, our protagonist. He’s a typical average guy who likes to play video games in his underwear, collect random trivia, and listen to obscure 1980s new wave music in his spare time. He’s also dealing with some problems in his marriage. Ever since Joel’s wife Sylvia got her promotion at IT, she has been preoccupied with one classified project after another, and the secretive nature of her work along with the increased hours have made the two of them drift apart. All that was supposed to change with the couple’s plans for a second honeymoon in celebration of their tenth anniversary, a romantic week where they’ll have each other all to themselves in the remote mountains of Costa Rica. Unfortunately though, while at the New York City teleportation center on his way to meet up with his wife in San Jose, Joel suffers a terrible mishap. The incident results in Joel being duplicated, raising some serious questions about the truth behind teleportation—questions that certain parties will go to great lengths to silence. As I said before, The Punch Escrow is like nothing else I’ve read before, which makes the story difficult to describe beyond what I’ve written above. I’m also nervous to reveal too much, because I would be loath to spoil anything for prospective readers. This is a book full of amazing surprises, and it’s really no exaggeration to say that it’s best to go in with fresh eyes, knowing as little as possible about the plot. I can, however, extol the awesomeness of safer subjects, like the world-building. Brace yourself for some really cool stuff. Klein has created a futuristic society here that is extraordinary in its originality and carefully considered approach, which is probably why the setting also seems so believable despite some of its more bizarre features. Humanity’s salvation has come in the form of the mosquito, for example, after genetic tinkering has effectively turned these hateful little bloodsuckers into tiny steam reformers, feasting on carbon fumes while excreting water. Didn’t I tell you this book was fun? I mean, how could I not laugh out loud at the author’s descriptions of the gorgeous twenty-second century NYC sunsets, made possible only by the ubiquitous misty clouds of skeeter piss? Massive changes have also occurred to political systems worldwide, with transnational mega-corporations governing at the helm and capitalism reigning supreme. While poverty has effectively been eliminated, money still talks, and with enough chits at your disposal, you can do things like pay other self-driving cars to prioritize your arrival if you need to get some place fast, or even buy anti-aging treatments to extend your life for as many years as you can afford. But if you’re worried that the hard sci-fi elements will become too heavy or overwhelming, fear not! While there’s a lot of techno-jargon in this story, as well as—I won’t lie—a significant amount of quantum theory involved, much of it is presented in an engaging, entertaining and often humorous way. I even devoured the very technical footnotes, which is huge for me because 1) I hate footnotes, and 2) the ones here are theoretically optional. So trust me, if a total quantum physics noob like me can read this book and enjoy the heck out of it, then anyone can. 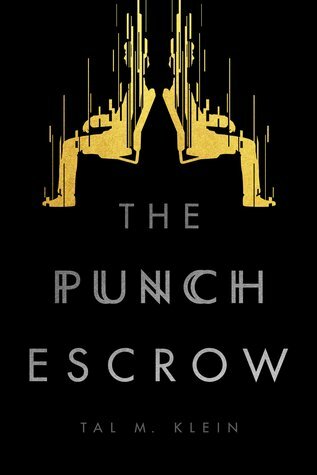 Bottom line though, if all my gushing so far has felt as random to you as it has for me, here’s what it all boils down to: The Punch Escrow is one of those wholly unique, mind-bogglingly innovative novels that only come once in a blue moon. The story (which I’m just dying to say more about but can’t) is extremely fun, fast-paced, and thrilling, yet there’s also a deeper, tender side to our protagonist’s existential journey and moments where he experiences meaningful philosophical reverie. There are also ideas in this book that are so incredible that every few pages I simply had to stop and marvel over a sentence or passage, speechless at the sheer imagination. Seriously, short of begging, I really don’t know what more I need to say in order to convince you to read this book. Oh, what the hell. Please, please, please, just go and check it out now, please! I see you call it book 1 of a series. Does it standalone satisfactorily, or is it one of the new breed of series, where it is actually one, long, on-going, story artificially chunked up into “books”? It has a full story, with closure to the main conflict. However, the epilogue leaves off for something big possibly to happen. Hope that helps! I loved this book, but I get that it might not be for everyone. But say, if you read it and decided not to continue with the next book though (if one does come), it definitely wouldn’t make you feel like you wasted your time because you were left with an open ending, if that makes sense! Sounds pretty awesome!!! Love books with wiggy sci-fi craziness and your 5 star rating certainly makes me want to check this out. I’m supposed to be getting a copy of this, so YAY! Gosh, another winner from Inkshares!!??? I’ll be checking this out for sure! Yes, Inkshares has been a roll lately! Haha, no problem! Is it just my blog, or just wordpress blogs, or just a whole bunch of blogs not showing up in general? Well, one would have to be blind, deaf and overly distracted not to be carried away by your enthusiasm! 🙂 If you throw an incredible premise like that into the mix, this book quickly becomes a MUST READ. Added to the list, and thank you very much! Thanks for the link! That’s a great article, and I think it gives readers the perfect sense of the book’s style and humor. I got a chance to chat a bit with the author on twitter too, and he is a really cool and funny guy as well! Wow this sounds awesome. LOVE that idea of teleportation- and a duplicate? *gulp* that could get awkward! This one sounds fabulous, and sorta reminds me of Dark Matter a bit with the way it apprently melds thought provoking issues with page turning. I’m glad I managed to pique your interest! 🙂 I hope you’ll enjoy it if you get the chance to check it out. And good luck with Dark Matter! lalalalallala – not listening (or looking) – I’ve just started reading this and I want to be kept in the dark – although I know you won’t have any spoilers. And, thanks, I’m picking up this book because of your comments about how great it is! Oh my goodness, I can’t WAIT to hear what you think!!! You certainly have me convinced! I’m DYING to know what happens in this book. Now just to hunt down a copy. First, this is totally going on my TBR. You’ve definitely sold me. Second, I also need to read this because I am constantly bemoaning the fact that teleportation isn’t a thing yet so maybe a book about it all goes horribly wrong will help me feel a little less cheated by our lack of it in this era? Great Review and thanks for highlighting it!